One of the main attractions in Iceland is a giant Ice-Lagoon filled with icebergs as they melt off a glacier and float away into the Atlantic Ocean. 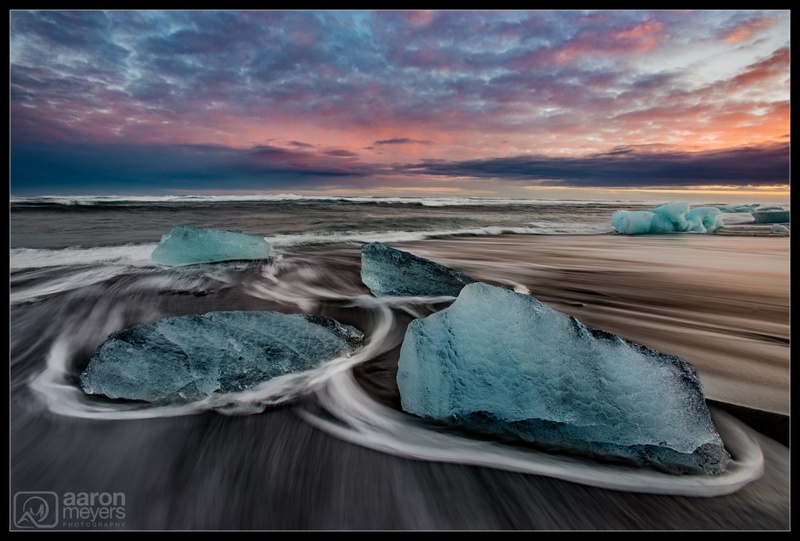 The powerful waves break up the icebergs and push them back onto shore, where they wash up on a black lava sand beach. The ice-lagoon and the ice-beach were 2 of the spots that I desperately wanted to see on my first trip to Iceland. On this particular evening we were hanging out at the Jokulsarlon ice-beach and the sun just managed to peak its way out of the clouds and cast a little bit of orange light into the sky. Willie, Alan, Rebecca and I kept dashing back and forth, trying to get close to these icebergs while also not getting completely soaked.